We’ll have to supply our own brass hinges and a suitable pair of knobs or handles (even if they’re only temporary) but shelf lugs and catches (possibly rare Earth magnets) will be provided by the college. While it may not be to everyone’s tastes, it is pretty simple and should be straight-forward enough to complete within the allocated time. While trying to keep things square and simple, I’ve drawn this initial sketch with through-tenon joinery connecting the top and base to the sides (I’ve said before that I’m a fan of the Arts & Crafts-style, even though I doubt you’d see many of such pieces made from sapele/mahogany…). My idea with the doors is too create a book-match effect across the two, using contrasting oak veneers. As you may recall from the 2009 exam piece, I discovered how well oak and sapele complement one another. Naturally, I would also use contrasting oak wedges to secure the through tenons. This piece must have an adjustable shelf, and I assume, at this point, that there’s no harm in having two or more. 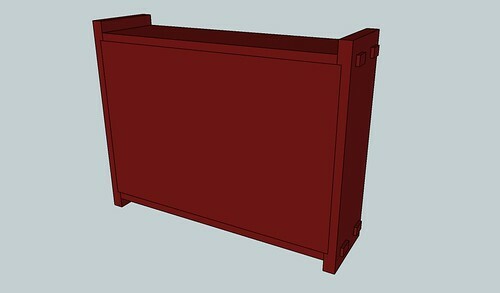 With an overall length of 450mm, I feel it would be better to divider the space up in two. 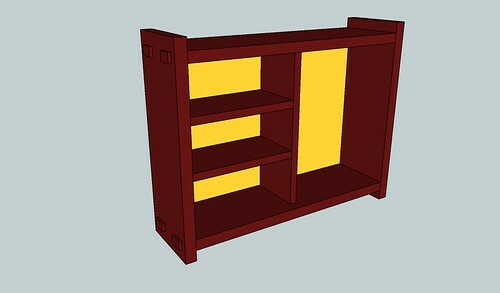 If possible, I’d like to keep the shelves (13mm) slightly thinner than the cabinet sides (19mm). If veneered MDF is available in the right thickness, I may use that. I’ve also drawn an oak back panel (on the inside). Again, this continues the contrasting theme though, it would also mean I had to veneer my own panel from scratch (as I will do, with the doors). If allowed, I may cut some of my own veneers from some of my English oak offcuts in my own workshop, on my Startrite bandsaw. I often find the commercially-available veneer sheets lack enough character, particularly with oak (which I believe may commonly be American?). It’s not like on that table I made last year, where I could simply slide the MDF drawer base out and replace it with a piece of oak! We also have to consider how the piece will be mounted to a wall. I’m currently looking at cutting a rebate for the back panel, which could be done after the carcase is assembled, using a bearing-guided router cutter. If the rear edges were grooved, I’d have to stop them short of the ends otherwise, they’ve be clearly visible in the finished piece. Having the rebates would also give me an extra 6mm or so (!) of depth inside the cabinet. As far as hanging this unit on a wall is concerned, it looks like the use of a French cleat is not an option, with the back panel a mandatory requirement of the design brief. So, I’m thinking of using slotted screw holes (as I did on the cherry bookshelf) and there may just be enough room in the 19mm extending above the top… Then again, I’m still scratching my head on this one. 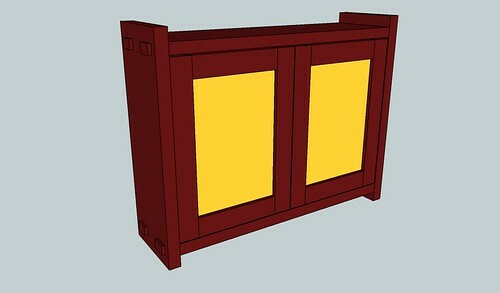 I want a “concealed” fixing (so, no screw holes in the back panel!) and I may just use ordinary brass hanging plates, or something similar. Why am I sat here, on my PC, on the hottest day of the year so far?? ?